Republicans say White House interfered with FCC on net neutrality. They're wrong. The White House Gave the FCC Advice on Net Neutrality. That’s How It’s Supposed to Work. 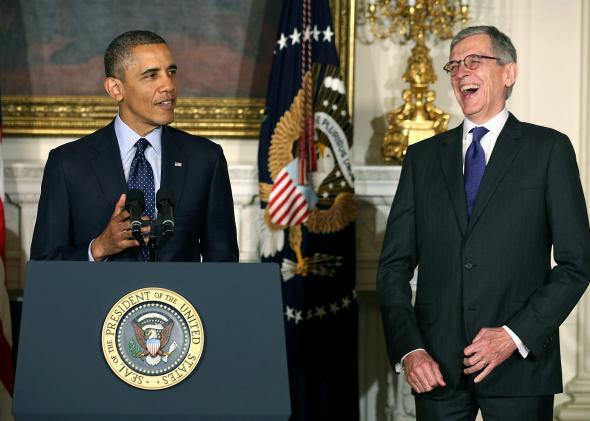 President Barack Obama and FCC Chairman Tom Wheeler. Tom Wheeler, chairman of the Federal Communications Commission, recently announced support for strong net neutrality rules grounded in the FCC’s strongest legal authority, known as “Title II.” Following Wheeler’s announcement, average Americans, entrepreneurs, and civil libertarians cheered the use of Title II. But those supporting the cable industry’s assault on rules are now crying foul. They claim President Obama’s November public statement favoring Title II tainted the FCC’s entire process. A Republican FCC commissioner and former Verizon lawyer, Ajit Pai, refers to Wheeler’s plan simply as the “Obama Plan,” and a House committee headed by Jason Chaffetz and Senate committee headed by Ron Johnson (both Republicans) recently announced they will probe the White House’s supposedly nefarious involvement in the FCC’s proceedings. But the cable industry and its allies are grasping at straws. This network neutrality proceeding is an example of how the government should operate. The vast majority of Americans—Republican or Democrat—support net neutrality, as do businesses across a wide range of industries. The cable industry is just complaining about a process by which both Obama and Wheeler reached the same obviously right answer: that the American people should control the Internet’s future. First, by all accounts, the FCC and White House ran parallel processes to reach their own conclusions. The FCC published a (hugely problematic) proposed rule in May and invited feedback from the public. The commission received millions of comments from Etsy sellers, Tumblr users, Vimeo filmmakers, Kickstarter backers, and Internet users of all walks, as well as detailed analyses from professors, technologists, and advocacy groups. The chairman met with startups in New York and San Francisco, most of whom have zero lawyers, zero congressional lobbyists, and definitely no FCC lobbyist. During the fall, the FCC held a set of hearings on a range of topics, from jurisdiction to bright-line rules and constitutional challenges. News reports suggest that the meetings with startups helped change Wheeler’s mind on his initial proposal—and Wheeler was perhaps the only person who attended every minute of the FCC hearings. Before Obama’s statement in November, White House staffers likely had to gather the views of the administration, which presumably included discussions among various agencies, from the Department of Justice to the Commerce Department. As part of this process, they reviewed material and met with parties on all sides. Second, it is customary for the White House to make its views known to an independent agency like the FCC, often through a legal filing. Four million Americans commented in the FCC’s proceeding, as did dozens of senators, members of Congress, and mayors. Commissioner Pai, Rep. Chafetz, Sen. Johnson, and Comcast seem to suggest that the one person in the world who cannot make his views known to the FCC is the president of the United States. It is customary, however, that the administration file comments with the FCC, just like anyone else. As I pointed out in Slate months ago, the Obama administration has made more than 200 filings to the FCC in more than 80 proceedings. Republican administrations made their views known to the FCC regularly; the Reagan and George W. Bush White Houses both commented on media-ownership rules. In fact, a specific agency called the National Telecommunications and Information Agency is tasked with letting the FCC know the administration’s position. Third, and finally, to suggest that the White House shouldn’t file comments with an “independent agency,” like the FCC, misunderstands the administrative-law meaning of “independent agency.” To be independent, an agency merely must have commissioners who are appointed for fixed terms and who can’t be fired by the president. The president can fire the head of nonindependent agencies like the CIA or EPA at any time. But he can’t fire Tom Wheeler or any of the other FCC commissioners. Since Obama can’t run for re-election, he can’t even threaten to withhold Wheeler’s reappointment. The cable industry and the politicians who support it can complain about the FCC’s process all they want. What really bothers them is that the process is supposed to be rigged in their favor. It was in many ways: They had the all the money, the lobbyists, and the air of political inevitability that makes the possibility of Title II such a surprising political victory for the public. That alone means the process was probably working as it should—responding to the public, not the giant interests who usually get their way. Disclosure: Marvin Ammori is a lawyer who advises technology companies that support Title II and has advocated for net neutrality before the White House and FCC.